RansomSaver is a free addin to block ransomware emails in Outlook. This addin adds an extra tab in MS Outlook and keeps monitoring the incoming emails. If it finds any incoming email having malicious attachments or ransomware, it immediately deletes that. In addition to that it scans the current email folder for further detentions. It creates a separate folder in Outlook where you can see the email that it has deleted so far. Not only automatically, but if you think there are some malicious emails, then you can manually scan the emails as well. For the ransomware detection and removal, it allows you to opt for certain options. For example, if it detects a ransomware or equivalent threat, then it can delete the attachment only, email body only or the whole email message. Online threats nowadays are growing faster and the primary medium of those threats is emails. So, it’s a good idea to build a strong mechanism against those threats to keep yourself safe. And RansomSaver addin can provide you that level of security free of cost. However, in my personal opinion, you shouldn’t rely on this addin but in addition you can also use latest antivirus software or ransomware detection tool. How to Block Ransomware Emails in Outlook? RansomSaver addin is a very nice addin for Outlook to detect and delete ransomware emails. 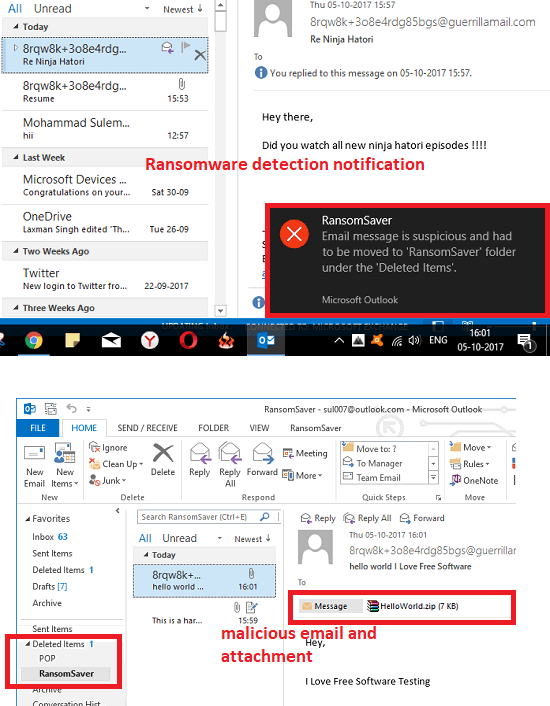 You can see the RansomSaver folder in the Delete folder of Outlook where it throws the malicious email along with the attachments. 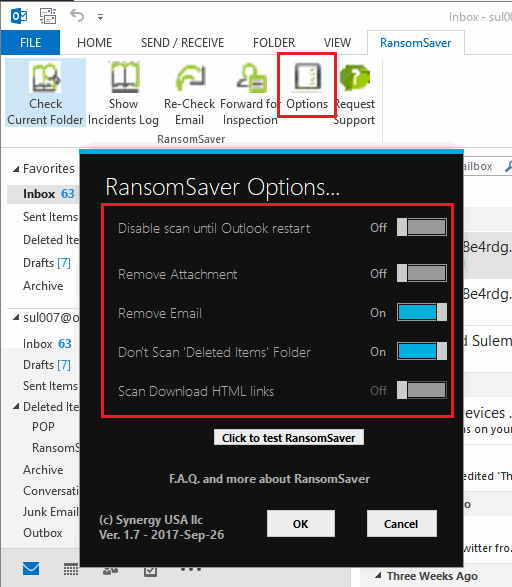 There is a separate tab of RansomSaver on the main interface of Outlook. You can configure RansomSaver and opt for certain options like scanning whole email folder, forward selected email for further analysis, show incident log, scan current folder, etc. Go through these steps to see how to detect and remove ransomware emails from MS Outlook. Step 1: Download and install RansomSaver from the URL at the end. After the successful installation of addin, you will see its tab on the main window of MS Outlook. Step 2: Now, if you want you can configure it according to your will. From the addin settings, you can opt for certain options like remove email, remove attachment, don’t scan deleted items folder, scan html links, etc. Step 3: Now, when the software has been configured, it is ready to use. Whenever a malicious email will arrive, it will detect that and immediately delete that email. You can see the desktop notification that it pushes, showing that it has detected an infected email and has deleted it. 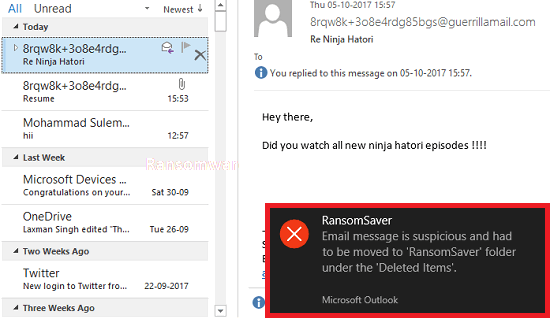 Later on if you want to see that email, then you can see that in then RansomSaver folder which is present under the Delete folder of Outlook. With the help of these handy steps, you can easily detect and remove ransomware emails from MS Outlook. The RansomSaver addin for Outlook is an outstanding solution to delete malicious emails automatically as they arrive. RansomSaver is a very handy and powerful solution to detect and block ransomware emails from Outlook. And if you often use Outlook as an email client on your PC, then it’s a good idea to install this addin. This addin will always protect you from ransomware and your data on PC will remain secure.